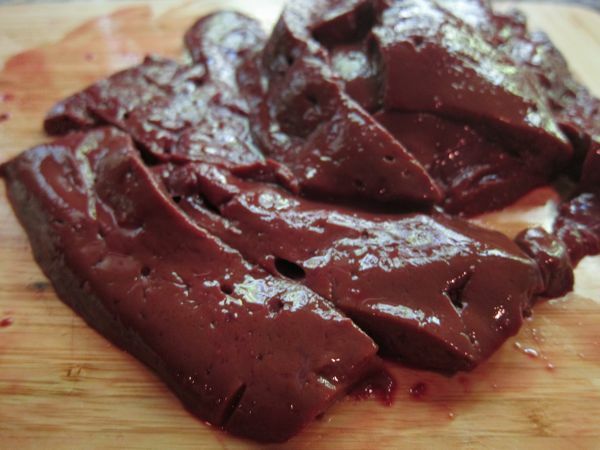 Raw liver has a distinctive reddish-brown almost purple colour. It is also completely opaque. Is there a name for this sort of colour? My first instinct is mauve, but that's not quite right. Edit: To put this in context, I would like to describe a chunk of raw liver in a way understandable by a twelve-year-old. To artificially narrow the audience, suppose the reader is aware that the liver is an internal organ, but they are not necessarily aware of what it does or looks like. After the description, they should be no more aware of the liver's function in the body, but have some idea what colour it is. "Mary pushed the _______ lump of raw liver around her plate." In the context you've given, I'd personally use the word livid (Dictionary.com). Livid is often used to describe the color of fresh bruises and it also has the meaning of being speechless with fury. Although the picture you've posted doesn't appear that way, in my experience, raw liver is pretty similar in color to the deep reddish purple of fresh bruises. I think livid not only conveys this, but also adds a sort of distasteful, gross feel that would match your context. If you think that 12-year-olds won't understand that context, you could consider using bruised instead. 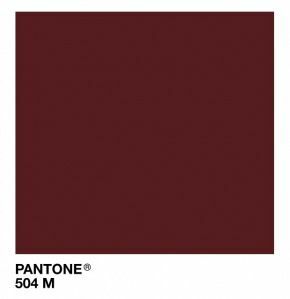 I would describe it as a bloody color, but my English teacher would probably say it's Burgundy, which is the answer you're probably looking for. Update: I would like to point out that liver is in fact a color, as @BiscuitBoy pointed out. Of the color of blood; red; ruddy: as, a sanguine complexion; the sanguine francolin, Ithaginis cruentatus; specifically, in heraldry, same as murrey. It is a bit problematic though since blood color can come in many shades depending on the state it's in: It can be very bright when it's thin and fresh or very dark when it's clotting and despite being very apt by definition for many contexts, I have never seen anything directly described with this word. Of a mulberry (dark-red) color. Given that these are colors of heraldic tradition, you might also be able to examine a coat-of-arms with the color. The Heraldry Society's Education Pack P.D.F. pack may be helpful. Although the C.D.C. considers these words synonymous, which makes sense given that berries may have been used for such pigmentation, Sanguine seems to be a brighter color than Murrey according to the H.S. P.D.F., so despite the semantic appeal of Sanguine, Murrey would be more accurate if both words don't refer to the whole spectrum of reds blood and mulberries can be. Speaking of contingencies and convenience both of the above Wordnik links also contain entries in The American Heritage Dictionary, 4th edition which is a newer and presumably less rare book than the multi-volume C.D.C. if you need to verify with a print source. Ironically, "liver" is used to describe a color of dogs' coats. In Spanish and French, marron, which means chestnut, is also used to describe shade of reddish-brown. It's rough equivalent in English is maroon, which can be anything from a deep red to a reddish-brown. Yet maroon conjures up the color of a car more than it does the color of a liver. "The maroon liver" seems cartoonish. As a 12-year-old child, I would have immediately understood "reddish-brown" and been encouraged to look up "dense", thus learning a new word. Not the answer you're looking for? Browse other questions tagged single-word-requests colors or ask your own question. A word to describe the color of hair that is nearly jet-black, but slightly brown? Why is the colour green associated with both growth and illness? What's the name of the buildings/infrastructure collecting raw resources? Is there a word that means a colour used metaphorically? Why is it that in English we put the colour before the object but in many other European languages they put the colour after the object? Word/phrase to describe someone skilled at using/combining raw materials to make something impressive?